Easy and quick database administration, natively supports MSSQL, MySQL, SQLite, Postgre SQL, MS Access. Main features: Creating and restoring backups. Transfer data between databases, tables and data files (supported formats are XML, CSV, HTML, Excel). Edit database schema, tables, views and other db objects. Run queries, generating query templates. View, edit, filter and sort data in tables. More features in Proffesional edition. * Creating and restoring backups. * Transfer data between databases, tables and data files (supported formats are XML, CSV, HTML, Excel). 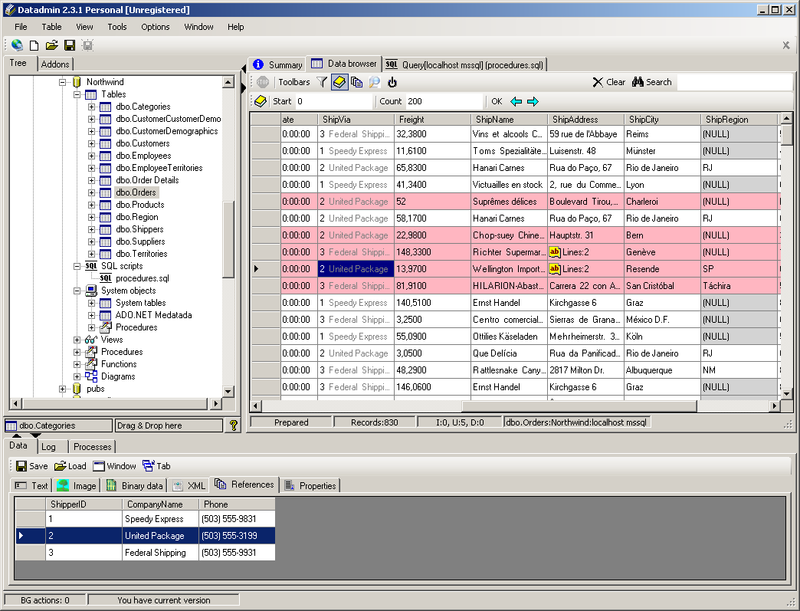 * Edit database schema, tables, views, view, triggers, stored procedures. * Run queries, generating query templates. * View, edit, filter and sort data in tables. * Display data from referenced tables. * Database modeling, reverse engineering. * Migrate database between all supported platforms. Qweas is providing links to DatAdmin 5.0.5 as a courtesy, and makes no representations regarding DatAdmin or any other applications or any information related thereto. Any questions, complaints or claims regarding this application DatAdmin 5.0.5 must be directed to the appropriate software vendor. You may click the publisher link of DatAdmin on the top of this page to get more details about the vendor.